LEAN ON PETE is British drama film written for the screen and directed by Andrew Haigh (45 YEARS), based upon the novel of the same name by Willy Vlautin. 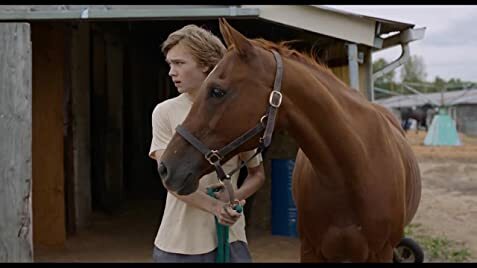 LEAN ON PETE is also the name of the horse that both changes and challenges the life of 16-year old Charlie (Charlie Plummer). The film is about a boy and a horse, but not for the whole duration of the movie. When the film opens, the audience sees Charlie with his father and new girlfriend. Being dependent on his father for a limited amount of money, Charlie befriends horse owner Del (Steve Buschemi) for a job. He is introduced to a horse called LEAN ON PETE. When the horse loses a race, coming in last, the horse is to be sold off to die. The film benefits from the performance of its young lead, Charlie Plummer who has already proven himself in the role of the millionaire Paul Getty’s nephew in ALL THE MONEY IN THE WORLD, playing opposite Oscar Winner Christopher Plummer. Charlie is no relation to Christopher Plummer despite the identical surnames. Charlie Plummer captures the pain and desperation of a teen unwanted by both parents. He has still the look of innocence that will have the audience on his side no matter the bad deed he commits. In one scene, he suspects that he might go to jail, but heaven forbid if he does! When the film screened in the main competition section of the 74th Venice International Film Festival, Plummer won the Marcello Mastroianni Award for Best Young Actor or Actress. Besides Plummer, Buscemi and Zahn both stand out in their supporting performances. Both actors reprise their quirky character roles, though their character are very different. 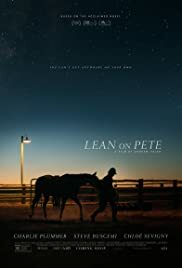 LEAN ON PETE moves at a slow pace during its first two thirds of running time before switching gear with a story twist. Haigh’s camera loves to linger on the actors. On the few action scenes, the two punch up scenes and the one where an accident occurs with Pete (the details not to be mentioned in the review as to avoid a major spoiler) are executed with quick edits as to create a shock effect. This succeeds as the audience is clearly jolted out of their seats the three times. Haigh’s film suffers from a suitable ending. He opts for the Charlie running off into the horizon (no sunset here), reminiscent of the famous French classic of youth, Francois Truffaut’s LES QUATRE CENTS COUPS (400 BLOWS) where Truffaut ended his film with young Jean-Pierre Laud running on the beach. Despite the film’s slow pace and other minor flaws, LEAN ON PETE comes off as a sincere film about a boy’s coming of age . The story shows that life does not always hands one everything on a silver platter. Some are born into riches and royalty. Others like Charlie are less fortunate, born into a broken family. He learns from his race horse, looking after Pete, the horse reflecting the same poor demise, Charlie the human is going through. Charlie struggles and makes it at the end. Haigh’s shows that it is a long and hard journey, but one that is necessary to take. On these grounds, LEAN ON PETE is a successful film, evoking the audience’s emotions and sympathy.